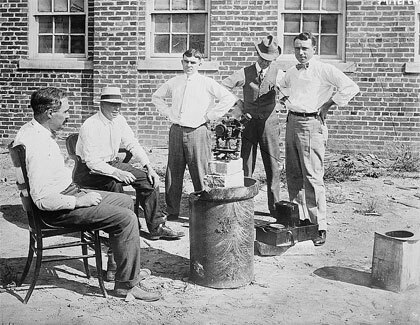 June 1912– A crew of county and city surveyors poses in at lot at 870 S. Harner Street, which would have been the exact geographical center of the city after the proposed Annexation of 1913. After a bitter battle (both physically and legally) with two of the eleven townships and villages to be subsumed into the city, the exact center of the city ended up being 1,053 yards southeast of this spot, where a brass marker, installed in 1916, is embedded in the sidewalk. In the intervening several decades, the center of the city has shifted and is now in the middle of a ParkSafe lot on Shannon Boulevard. There is no brass marker.